Connect a Shot Basketball Shooting Game Interactive – It's a shootout! 2 players go head to head and the first one to connect 4 balls in a row wins. All of your guests can watch as the participants put up their best while trying to stop the other from getting 4 in a row.The first player to get 4 in a row wins. It's kind of like Connect 4 but with basketballs. 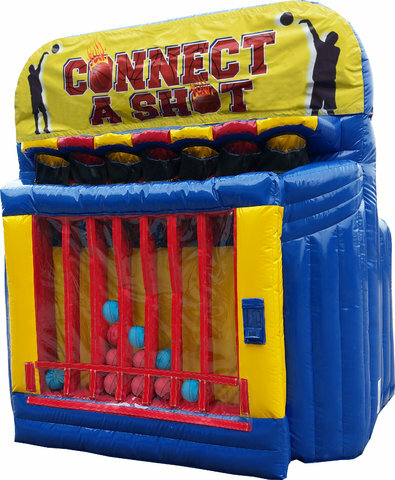 If you want the thrill that only a one-on-one shootout competition can deliver, check out the About to Bounce Basketball Connect a Shot Shooting Game Interactive. Cheer on each shooter they make basket after basket, bucket after bucket. The Connect a Shot Basketball Shooting Game Interactive is a 10’ L x 8’ W x 11’ H with very nice visual details and imaging. Priced at $149.95 for a five hour rental.